Horizontal 6" x 4" size is ideal for photos and custom graphics. Clear acrylic allows full view of inserts. Top loading feature makes sign changes quick and easy. 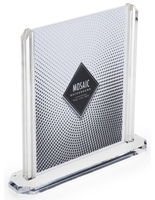 These stand-up sign holders are ideal for horizontal graphics up to 6"w x 4"h. Each picture frame is made from 100% acrylic with polished edges. These table tents, stand-up sign holders are double-sided and can display two graphics at the same time. 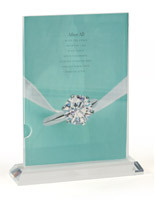 The clear acrylic base features slanted sides that add to the upscale design. 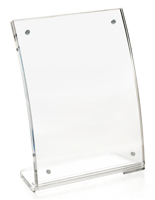 These stand-up sign holders that are double-sided are designed for use with custom graphics. 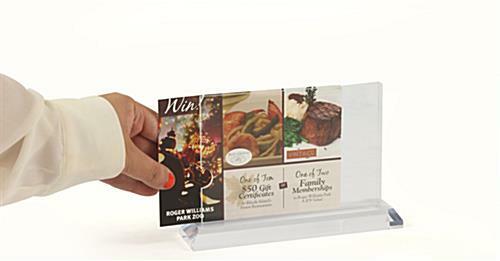 A personalized display can easily be created with any standard printer. 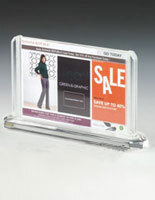 These stand-up sign holders, also called acrylic picture frames, feature a full-view design without borders. This clear design makes it possible to fully see any 6" by 4" inserts. These 6x4 stand-up sign holders that have a top loading design enable quick and easy sign changes. Menus, promotions, and other inserts can measure up to .0625" thick. One of the acrylic faceplates has a small cavity on the side making it easy to pull out the inserts. These stand-up sign holders that have a polished finish feature an upscale design that can be used in with any interior decor. Common users of these horizontal sign holders are restaurants, retail stores and residential homes. 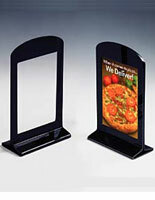 These stand-up sign holders, also known as table tents, are great for use as menu stands in any food establishment. 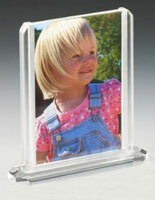 In a residential setting, these acrylic frames can display pictures and photographs. 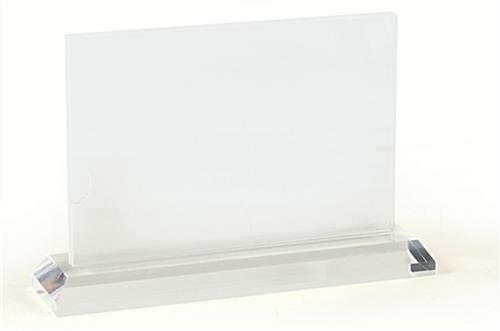 These acrylic stand-up sign holders are made for horizontal 6" x 4" graphics. 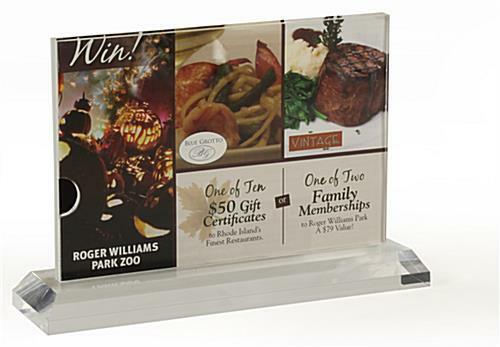 The low cost of these print displays make them a top seller for homes and businesses alike. 6.5" x 4.6" x 1.8"
We are using these for daily recognition award certificates in our department. We didn't want to spend a lot of money on them since we will be buying a large number of them. They were delivered quickly and are exactly what we need. My one complaint is the cut out on the right-hand side, which makes it look a little less fancy, but also does help with being able to get the document/picture in and out from the frame. Overall, we're satisfied!